The next installment in Lenovo’s successful mid-range Moto G smartphone series is not expected to become official for several more months, but the past couple of days have blown the G7’s cover wide open. A number of purported specifications were leaked first, followed by credible speculation about the family’s expansion to include no less than four 2019 variants, and now we get to check out the “standard” Moto G7 model in all its glory. Technically, we’re not dealing with real-life product photographs, but factory CAD-based renders created by prolific leaker Steve Hemmerstoffer, aka @OnLeaks, are truly the next best thing. There’s absolutely no reason to doubt the accuracy of these high-quality handset depictions, showcasing a trendy device with one of those increasingly popular “waterdrop” notches in tow, helping it substantially reduce screen bezels. This particular execution of the waterdrop concept doesn’t look all that hot, with the actual notch only housing a selfie shooter, but a separate earpiece-accommodating screen cutout at the top drawing quite a bit of attention too. The bezels themselves are far from invisible, the chin large enough to include a full “motorola” signature, while the dual rear-facing camera system simply looks bizarre. Almost like staring into your soul. Still, you have to remember this is a presumably affordable phone we’re dealing with here, so naturally, the design can’t be perfect. The rear-mounted fingerprint sensor embedded into the “batwing” logo is certainly a nice touch, while the headphone jack is here to stay. 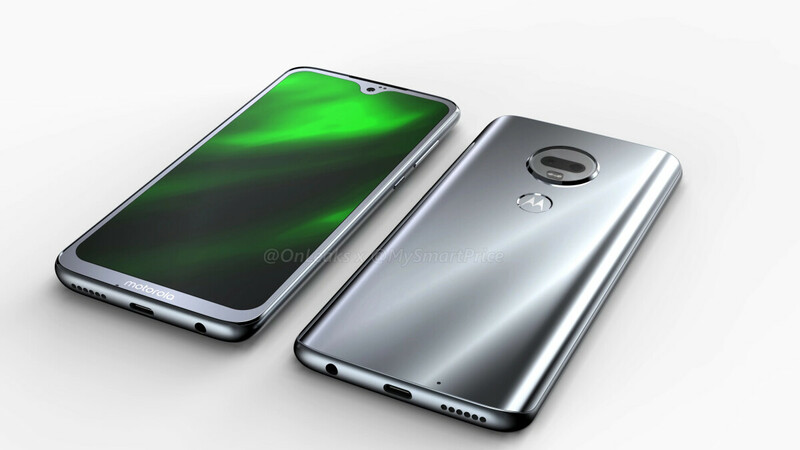 In terms of overall dimensions, it doesn’t look like that waterdrop notch is going to help Lenovo much, as the 6-inch Moto G7 is expected to measure a few extra millimeters in both height and width compared to the 5.7-inch Moto G6. On the bright side, the phone’s thickness will be slightly reduced, camera bump notwithstanding. No update on specs and features, so our best bet still includes Full HD+ display resolution, octa-core processing power, 4GB RAM, 64GB internal storage space, 3,500 mAh battery capacity, Android 9.0 Pie software, 16 + 5MP rear shooters, and a 12MP front-facing camera. Don’t take any of that to the bank, though. Should have been the Pixel 3 XL. If this has a decent camera I wouldn't mind picking this up as my new backup phone. Ugly. Make the screen corner radius match the device curve. It's not a bad looking phone, but I'm more inclined to go with Nokia, because they're offering faster updates. Might cost a little more but you're better off, Motorola support has gone to s**t since Lenovo got its hands on it. A new benchmark in Ugly. This thing makes the Pixel 3 XL look good. However it probably looks better in black like Rouyal mentioned above. Also phones tend to look better in real life too. In my opinion, waterdrop design is even uglier than regular notch design, except the Essential Phone who really got it right. I am still waiting for Motorola Moto G6 Plus to be release in Malaysia, until now there are no news.. For the Moto G7 I like the camera design more like the Moto G6/G6 Plus, o_O. Than this one. Just buy it elsewhere. I bought mine in Taiwan and using it now in KL :) Very very nice design, super loud bass-y speaker and very good camera (using Gcam). I just wish the phone is pure black than the indigo color. It actually looks pretty good. Put a snapdragon 710 or 670 in it and it will be a great midranger. People say that Apple aren't innovators anymore, but let's be honest, in a way, Apple did innovate the "notch" design and now it's become a thing to have on other branded smartphones (aside from the Galaxy). Stop making these phones bigger!! Nowadays you if you want a reasonably sized (meaning no wider than 70mm wide) new phone your only choices pretty much are the Galaxy S9 and the iPhone X. Although those are fine devices, they are also very expensive.